As a child I had the privilege of going wild blueberries picking with our family. We usually went with other families for a whole day, enjoying a picnic lunch at noon. We all helped to pick, but we also ate plenty throughout the day. Today we often read or hear about the nutritional benefits of blueberries as they are packed with beneficial vitamins & minerals so I have many reasons to serve them often. I don’t get to go picking anymore, but I buy plenty frozen during the winter or fresh in the store when they are in season. Well they are in season now so we enjoy them in many different ways a few times each day. The other day our son dropped off a bag of wild blueberries he had picked at the lake. They taste even better than the ones from the store; and I am sure they are even healthier. 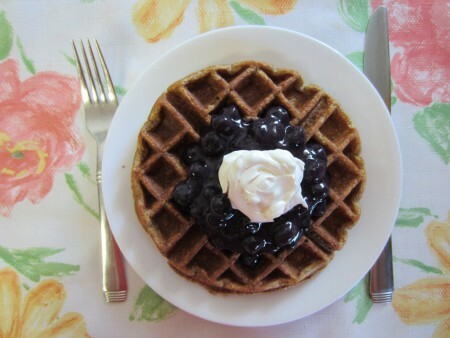 I made a new recipe for waffles on Saturday that is gluten free, dairy free and sugar free. Are they ever delicious! We topped them with a half cup of these wild blueberries. I made the recipe again yesterday for our children. I will definitely add this recipe to my COOKING WITHOUT MOM & EAT MORE WHOLE GRAINS cookbooks when I reprint as it is so easy, nutritious & quick to make. Now I want to share it with all of you too! These waffles are light yet very nutritious! Blend 1 cup oatmeal until fine. Add and mix in the 1/2 cup rolled oats, salt, baking powder and baking soda. In another bowl beat the eggs with banana, oil, stevia, vanilla and yogurt. Mix together with the dry ingredients until smooth. Bake in a heated waffle iron one at a time. My waffle iron bakes each waffle in 3 minutes. This morning I decided to make a big batch of these same fluffy waffles; enough to serve when unexpected company arrives. With no fuss I can easily invite them to stay for lunch. I just put out my favorite tablecloth. I made 5 batches of the above recipe with a few changes. I decided to leave out some eggs and substitute hemp milk & flax; adding some extra nutrients. There are now 15 waffles in the freezer. Once they are frozen I will transfer them into plastic bags. Here is this new larger recipe. Blend all ingredients together well & bake as in the above single recipe. To reheat these frozen waffles, I heat the waffle iron and put each in for a half minute of so. That way they are just like freshly made. Unless you like them soft like my husband. He reheats his in the micro-wave. I hope you and your family or guests enjoy these as much as we do. They certainly are delicious & packed with nutrition!